When removed, the security sticker will self-destruct to indicate that the security seal has been broken. 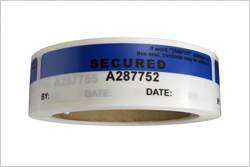 Our high residue security stickers offer enhanced security because the "high residue" tamper evident feature is more sensitive. Also, the "high residue" feature makes the security stickers more versatile and effective on a wide range of surfaces, materials and environmental conditions. When removed, the security sticker will self-destruct to indicate that the security tags has been broken. The tamper proof labels leave a minimal amount of adhesive residue on the surface when removed, which minimizes clean up on reusable containers or surfaces. Our non residue tamper evident tags provide both security and the added convenience to avoid leaving (or cleaning up) a sticky adhesive residue. After application to the surface, these tamper resistant labels will self destruct when removed, which exposes the hidden message "OPENED VOID" in the label.